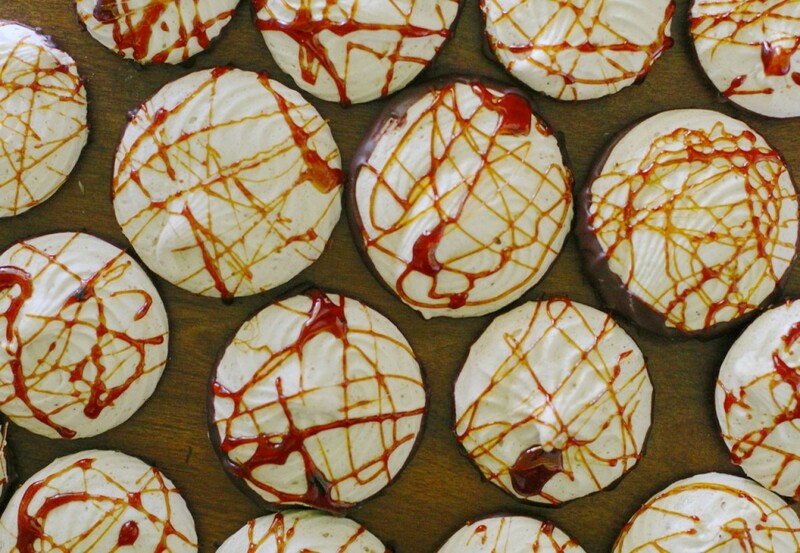 The sun came through the window and lit up the Toffee adorning the Salted Caramel Hazelnut Meringue Cookies, and the Angels sang! 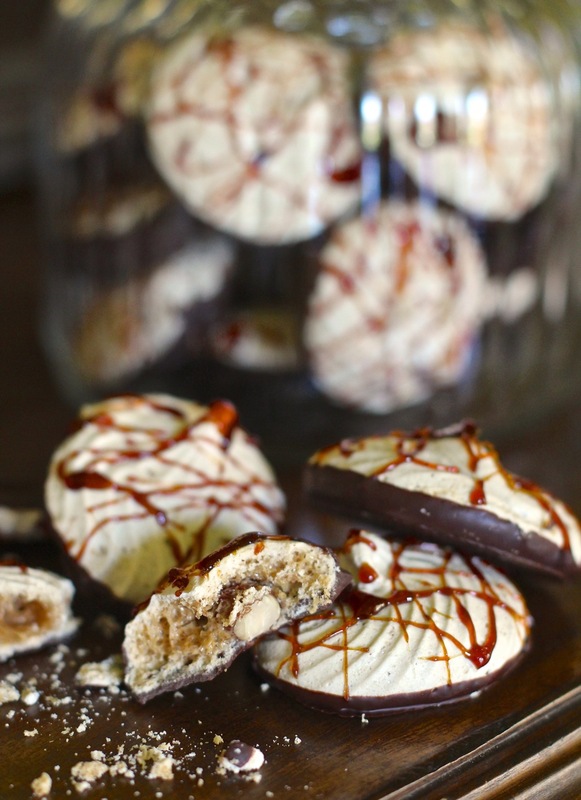 These pretty little Meringues are part confection, part cookie, and the perfect treat to accompany a coffee. Keep them in an airtight jar, and they will last for months and months! 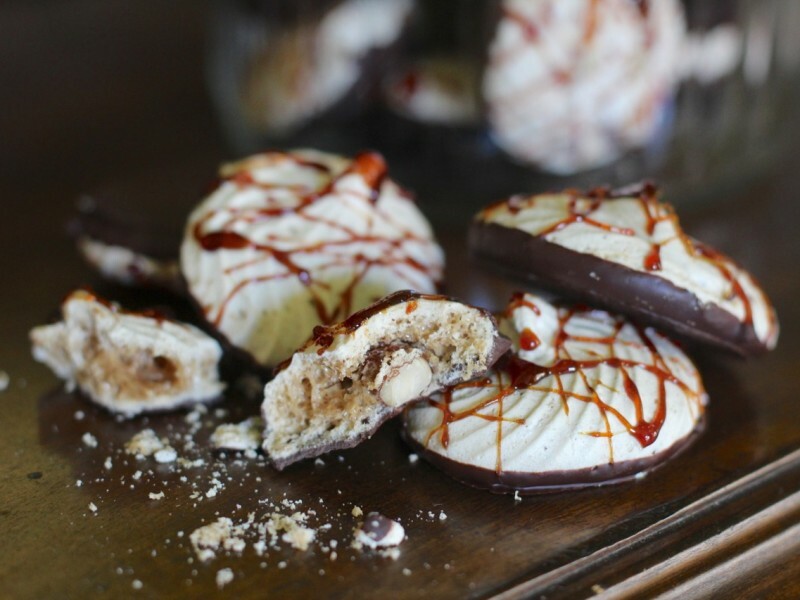 You can leave out the Salted Caramel flavouring if you prefer, and have a chocolate Hazelnut cookie, drizzled with chocolate instead. Either way, you get a delicious,tasty , gluten free treat , with a surprise of a toasted hazelnut in the centre! They are easy to make and aside from the cooking time, don’t take that long to make at all. Just make sure you follow the directions to have success. 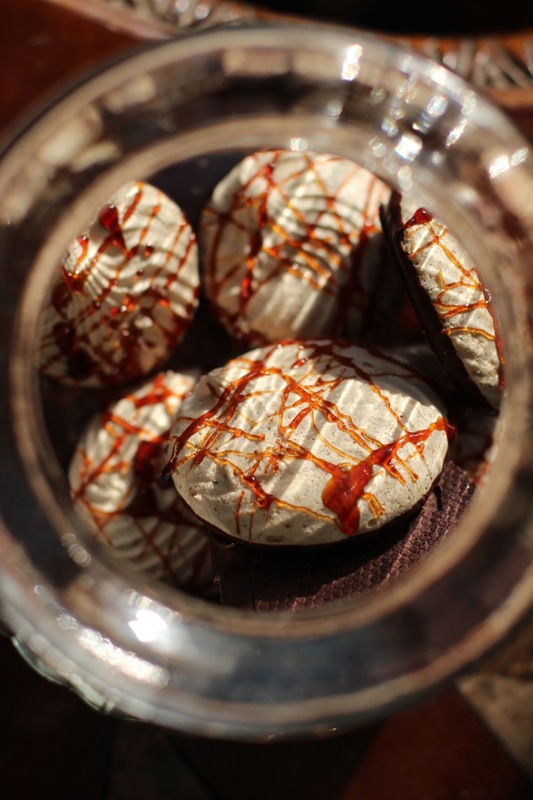 They are made using Aquafaba, instead of Egg whites! 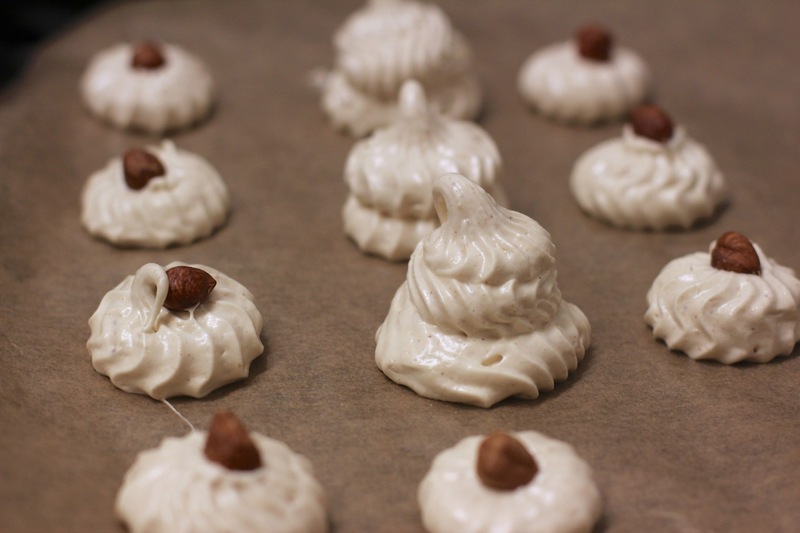 I use ButterBean Aquafaba, because I can’t taste it in cooking, whereas lots of people use Chickpea aquafaba, which I don’t like because of the taste. 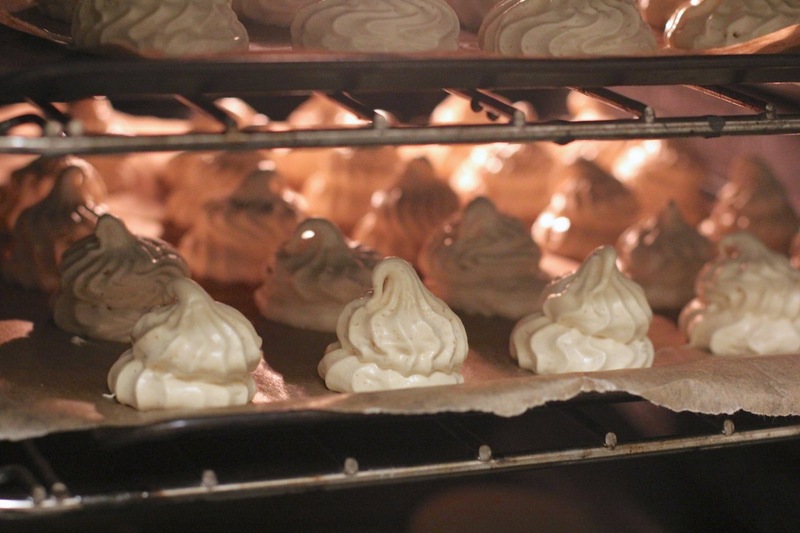 Aquafaba is the unsalted liquid from a can of Beans! It’s as simple as cracking a tin open and draining the juice to use! Or…you can make it yourself from dried beans, if you can be bothered! So, you’ll notice these have “Psyllium Husks” in them! They are extremely useful in baking, and also really , really good for you! They are extremely useful in Gluten free baking of muffins and breads etc, and I used them in the cookie, as when they are beaten in, they absorb moisture and add some structure to the meringue foam as they gel, which helps stop it deflating too much when the nuts are folded in to it, and they also provide a fine crunch to the cookie. If you can’t find any, then proceed without them- I haven’t tested them without yet, but I think they will still work, but the Psyllium is well worth getting! I also have a game changing recipe coming out soon, which requires Psyllium husks, so you will want to be prepared with those in the pantry to make the new recipe! I bought a huge bag of them on Amazon- probably a bit too much for the average cook, but as I experiment alot, I wanted plenty. Have a look online for them if you can’t find them in your local health food store. Buy them in a bag, not in capsules as they are expensive as they are marketed as a “health supplement”. If you use powder make sure you use the correct WEIGHT, and not measure by tbsp, as powder will weigh more per tbsp than the husk! You may find a candy thermometre useful to make these (and alot of other recipes I have ) , otherwise use the cold water test described in the instructions below. Take the mixer bowl and gently fold in the 60 grams of Ground Hazelnut until properly combined. These were piped using a Large Wiltons 4B tip(USA)Wilton No4b Carded Open Star Tip (UK) Wilton Decorating Tip, No.4B Star and a 50 cm piping bag(USA)JB Prince Heavy Cotton Pastry Bag 20 inch (50cm) (UK)Master Class Reusable Cotton Pastry / Icing Piping Bag, 50 cm (19.5″) to give that nice fine rippled shape. Pipe a round of meringue neatly onto the sheet, and then pop a little hazelnut on each, as shown in the pics, before adding an extra puff of meringue on top. They flatten a fair bit when cooking, so allow space between each so they don’t spread and join together, as that looks, well, crap! Once they are all piped out, place them in the top trays of the oven to cook. The oven temp is important- if your oven is too hot, you will burn them and possibly cause them to melt into a puddle! They will take up to two hours to cook depending on the type of oven (conventional or fan forced) and how big you have piped them. You will know when they are properly cooked as you will be able to peel them cleanly off the oven sheet! If it won’t come off without the middle sticking it needs longer! If it peels off cleanly ,but still feels a little soft, don’t worry. Turn the oven off and leave them in there with the door closed and once cool they will be crispy. 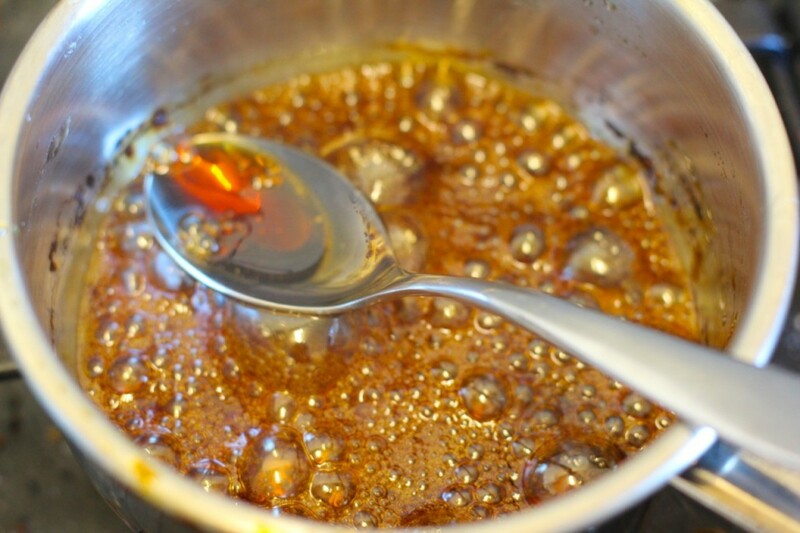 To make the Toffee, place the sugar and water into the saucepan. 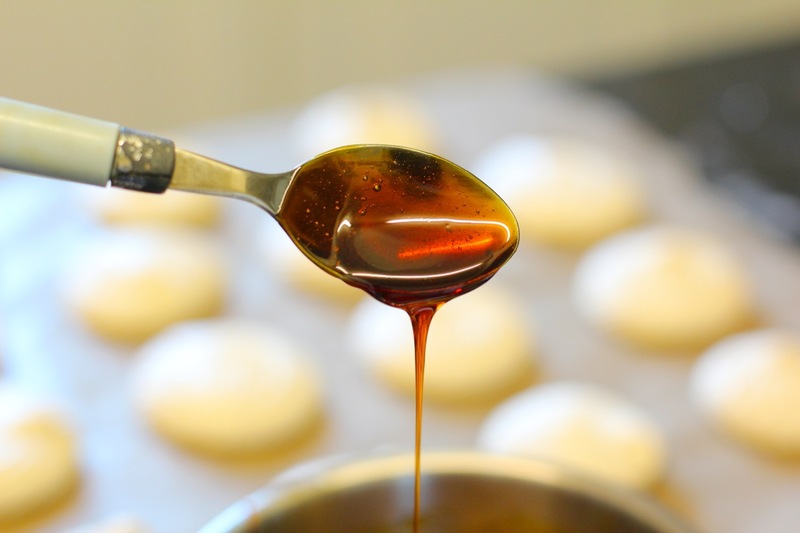 If you have Glucose syrup use it, as it stops the sugar crystalising around the edges as the toffee is cooking. (Wilton’s sell it in the USA-link here: Wilton Glucose to Create Smooth Elastic Gum Paste, 8.5-Ounce ) In the UK etc, you can buy it in the supermarket. If you DON’T use Glucose syrup then place your sugar and water in the pan and barely agitate it as it is cooking ,apart from the odd swirl to combine. You will need to bring the temperature up to at least 250c again, (use the cold water test) . Give it the odd swirl from time to time as the edges start to brown to combine it and once it has reached temp, leave it on the stove until it turns golden then quickly remove. It will still be bubbling so carefully give it a stir to calm the bubbles down and cool it slightly. You want it to cool enough that the consistency is like thick Honey. If it cools too much, it will begin to make Angels hair toffee strings and won;t stick, so at that stage, just warm it up again slightly. Sorry about the ugly teaspoon! 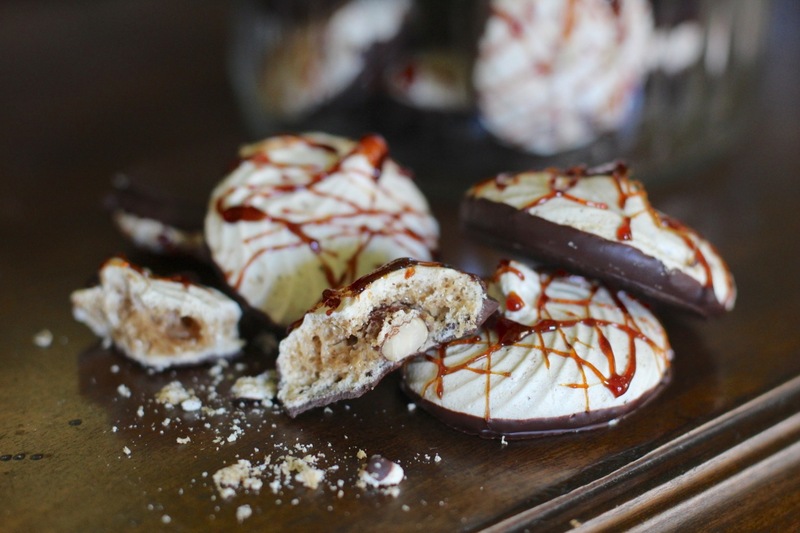 Drizzle the thick toffee over your cookies. You can do swirls, lines or criss crosses! Once the toffee is set, we can dip the bottoms in chocolate! If you are using a cheap chocolate ( like I did!) it will probably still be thick when it is melted as it has less cocoa butter in it, in which case you can add approx 1tsp of veg oil or refined coconut oil to the chocolate as it is melting to thin it out so you get a nice coating! If you are using a chocolate that runs off the spoon when melted, skip adding the oil as it is thin enough for the purpose! Come and join our Plantified FACEBOOK GROUP https://www.facebook.com/groups/Plantified/ and post some of your favourite recipes, ask some questions, show off a dish you’ve cooked or just have a chat! 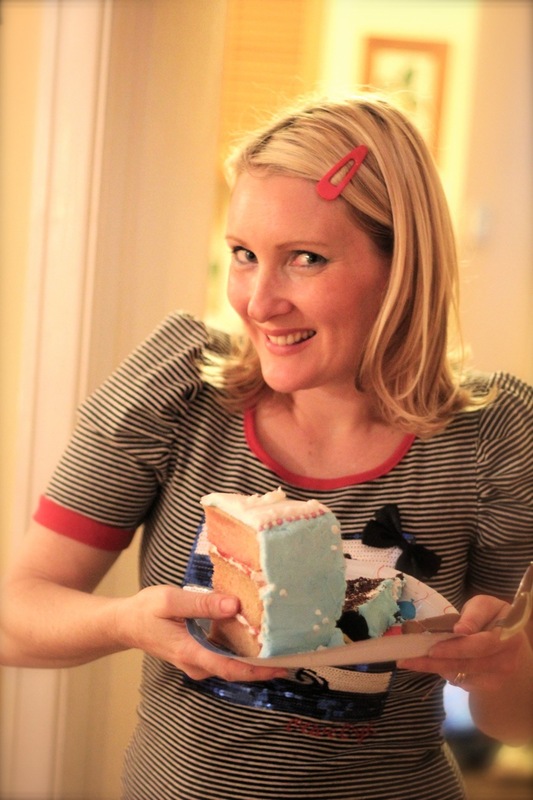 We have some AMAZING cooks on there with loads of great ideas to share! 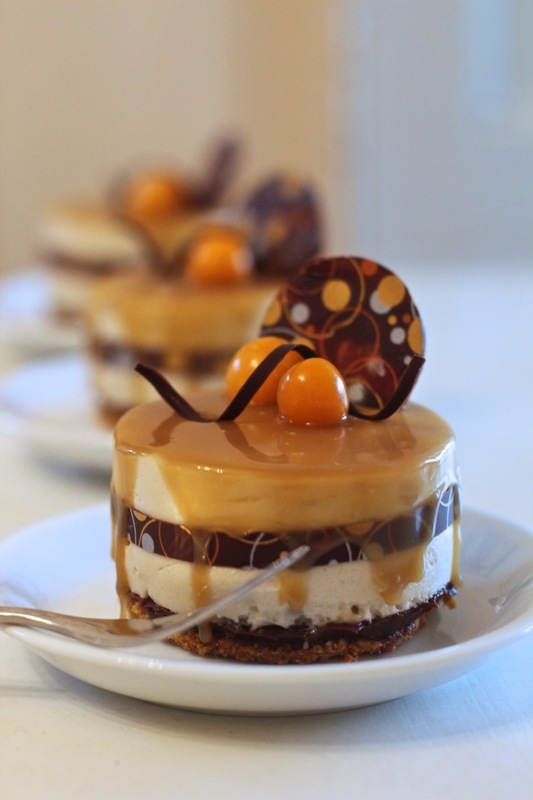 Caramel Mousse Entremet, as seen in the Free Mousse E-book for members of Plantified. If you are using a chocolate that is still quite thick when melted, you will need to thin it down somewhat with the addition of a tsp or so of veg oil or refined coconut oil so the biscuits dip nicely. 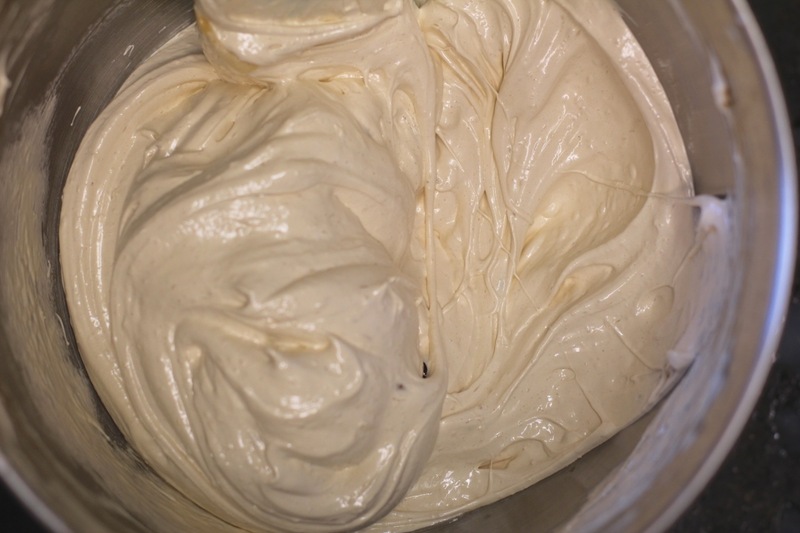 You can either use a hand mixer or a stand mixer to whip the Aquafaba.Make sure your bowl and implements are all clean and free of oil and make sure you use parchment paper to line your baking sheets. Measure out 175 grams (3/4 cup) of Aqua faba (the liquid from a can of chickpeas or butterbeans) and add it to the mixing bowl along with 2 grams (1/2 tsp) of Xanthum gum.Do not skip the Xanthum gum as this gives the cookies added shape and body. Turn on the Mixer and begin to beat.Continue beating while the sugar syrup is cooking. While that is mixing, make the sugar syrup for the meringues. Add the sugar, water and Glucose syrup (optional) to the saucepan and begin to heat. You want to raise the temperature up to 250 F, so using a candy thermometer to check is most accurate, however, if you belligerently refuse to buy one, you can do the ice cold water test to see if it is up to temperature , by taking a glass of cold water and dropping some syrup into it. If it is near the right temp it will form a firm ball which you can squish with your fingers once it hits the water. While the syrup is coming up to temperature, check the Meringue foam to see how stiff it is getting. 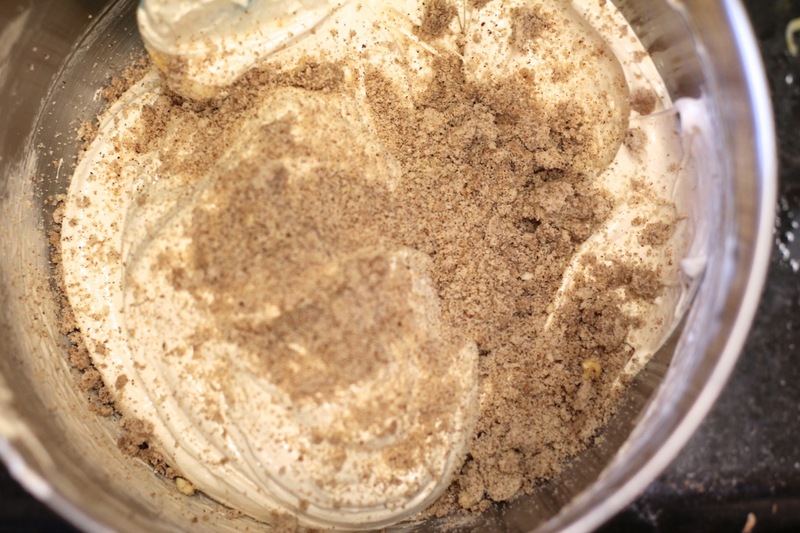 Once it forms stiff peaks throw in the reserved 70 grams (1/3 cup sugar), along with the 3.6 grams (1/2 tbsp) Psyllium Husks , 2 tsp Vanilla Extract and the 15 grams (3 tsp) of Salted Caramel Flavouring and beat in. Once the Sugar syrup is up to temp, take it off the heat and pour it into the mixer, whilst continuing to beat, until it is all combined. Place it into a large Vase or Glass etc, and fold down the collar so you can fill the piping bag hands free. Pipe a round of meringue neatly onto the sheet, and then pop a little hazelnut on each, as shown in the pics, before adding an extra puff of meringue on top. They flatten a fair bit when cooking, so allow space between each so they don’t spread and join together, as that looks, well, crap! If you have Glucose syrup, (Wilton’s sell it in the USA) use it, as it stops the sugar crystalising around the edges as the toffee is cooking. The toffee will set quickly. You can clean the saucepan up by soaking in boiling water to dissolve the toffee. Place a bowl over a saucepan with a little boiling water in it, to melt the chocolate. Put the oil in with the chocolate as it is melting. Once it is melted, dip the bottoms in the chocolate, and place either on parchment paper,( or as I did (to make the nice honeycomb pattern) , on a patterned silicon sheet, and place in the fridge to cool. 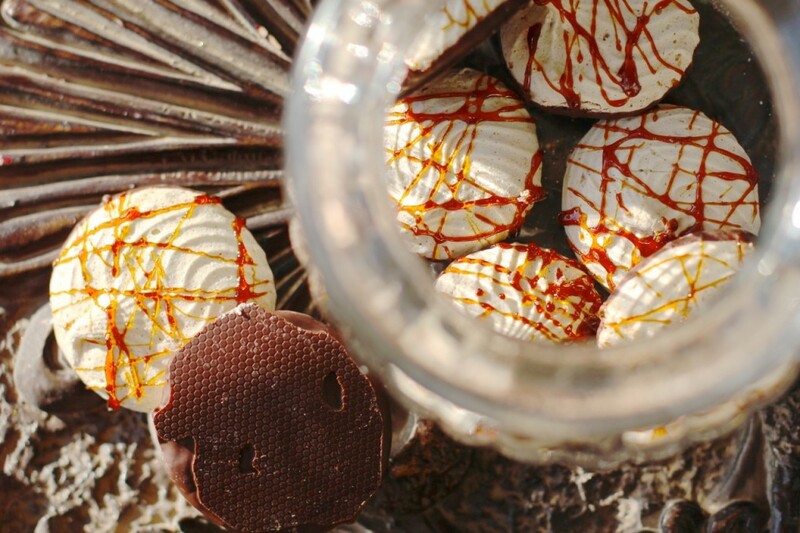 Once the chocolate has set firm, remove them form the fridge and place in an airtight jar, ready to be devoured! They will last for months and months, but it’s not possible to test the theory, as you will eat them all long before! They look gorgeous, I can't wait to try them! Can you tell me what the Psyllium husks do and are they necessary? 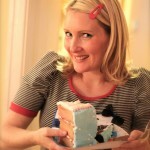 Hi Katrina, These look sooo gorgeous I'll have to try making them. I'm wondering how you seem to get the chocolate evenly around the bottom and edge without leaving finger marks in the chocolate from where you held the cookie when you dipped. Is there a trick to it? Thank you very very much for these delicious gifts to us! I just use the tips of my fingers to hold the top as I dip, and then I place them on a silicon matt with the honey comb impression to get the nice finish. There is enough height to the cookies that you can do so and the peak makes a handy handle!! Then I drizzle the toffee caramel over afterwards. A couple of questions. 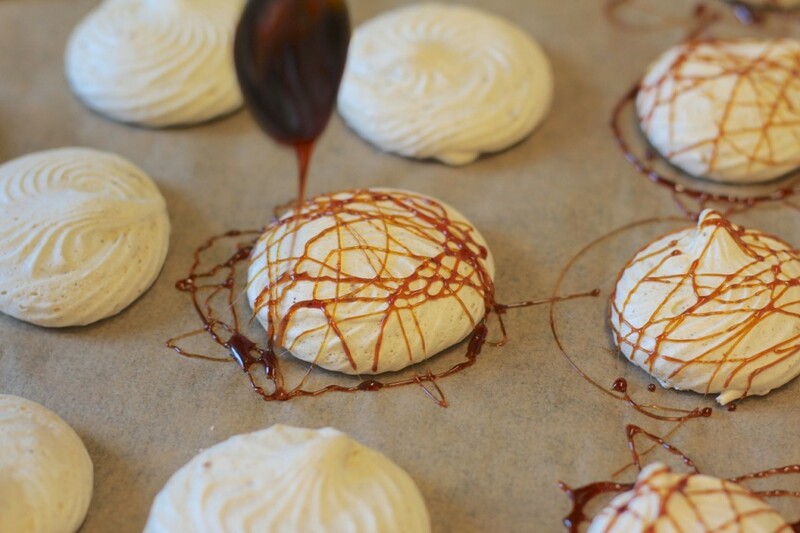 Have you tried making AF meringue using the sugar syrup technique successfully before? When you poured the syrup ,did you add it in a thin stream and beat while combining, or just add it all in in a large amount? The sugar cools as it beats in which adds to the structure ,as it is essentially liquid toffee. Another thing is, I REALLY beat my foam for a long time...it is the first thing I start with ,as even when it looks whipped and inflate, it whips up so much more with a longer time, so set your foam beating as the first thing you do. I will make a video for this technique at some stage so you can see it in action. Assuming your thermometre is accurate, my best guess then, is a)either adding the liquid too fast and collapsing it, or b) not having enough air in the foam to support it before adding.